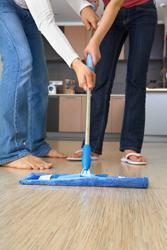 Nowadays we use a variety of materials to cover the floors in our homes. From tiles and lino to laminate and carpet, there is a whole world of choice and each material comes with its own pros and cons. Laminate flooring, for example, is extremely easy to clean with a mop or brush but on the down side it can seem quite harsh and cold underfoot. For many people there surely is no better floor covering than a carpet. Not only are carpets lush and comfortable, they keep in the warmth and can really make a room look good with their wide range of patterns and colours. Now, one of the problems with having carpets throughout the home is the problem of having them cleaned. They tend to pick up and hide a lot of dirt and odour, taking a real battering over the course of time. Carpets can easily lose their natural colours due to wear and tear but this vibrant colour is still there underneath all of that embedded dirt. That is why Clean Gutters are here to help assist you in your carpet cleaning. We have years of experience in carpet cleaning and have made hundreds of peoples’ homes look and smell even better after spring cleaning their floor coverings. If you would like to take full advantage of our fantastic range of carpet cleaning services then do not hesitate to contact us via telephone on 020 3540 7989 so that we can arrange a free estimate that is tailor made to your needs and budget. Unclean carpets make your home look dull and uninviting. Once our clients have their carpets spring cleaned by our professionals, it may seem like an entirely new home. The colours on the carpet will return to their former glory and all of the years of odour that are trapped in the fibres will disappear. This often goes unnoticed by people as they become accustomed to the lingering odours that are trapped in your carpet. Not only is it important to have your carpets looking clean and new but by doing this you are removing the possibility of picking up illnesses. Many allergies and respiratory illnesses are associated with unclean carpets, so don’t run that risk. When people try to do their own carpet cleaning themselves, they come across a variety of problems. There is the obvious expense of having to purchase or rent a dry and wet vacuum cleaner that will achieve really professional results. Not only that but they will have to fork out for costly, specialist carpet cleaning materials as well. All of this is not to mention the hours bent down on hands and knees scrubbing away at their carpets. So it is not all that surprising that it may not seem like an entirely enticing proposition. With our carpet cleaning company, we can make this job a breeze. We aim to work flexibly around you and can complete the work either when you are at home, working unobtrusively around you and you family, or, if you prefer, we can carry out our work whilst you are at work. Whatever your carpet cleaning needs, we are here to help. Now that you have read what a professional carpet cleaning company could do for you, what are you waiting for? Clean Gutters have been transforming peoples’ homes for years and can’t wait to do the same for you. We are sure that you will be amazed at our first class service and will be equally astounded by our low rates that are very difficult to beat.